Need assistance? Reach out to us. On May 1st, 2018, the County launched the FoodStat data analysis tool to the public. 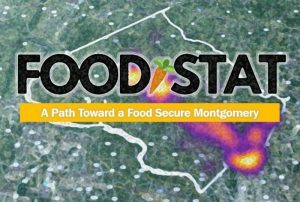 The Montgomery County Food Council, along with Manna Food Center, the Capital Area Food Bank and Montgomery County DHHS worked closely with CountyStat to create this online platform that provides context for, and further supplements the Feeding America data on the level of food insecurity in the County. It brings together more than 60 data indicators of need and vulnerability, and it is hoped that FoodStat will enable government agencies, food assistance providers and any other interested parties to analyze the community’s access to food, its transportation and infrastructure needs, high priority zones and service delivery gaps, leading to the creation of policies and strategies that will inform priorities, drive collective impact, and ultimately reduce food insecurity in Montgomery County. Manna takes pride in our tradition of being a reliable and hospitable safety net for the vulnerable among us. Manna has earned a reputation over 32 years of dedicated service, one participant at a time. We do this by building on the the experiences and expertise of our staff, the insights of our loyal volunteers and the perspectives of partners and participants. Our institutional expertise and operational capacity has become increasingly sophisticated, and facts and statistics show Manna now stands as the most effective nonprofit food resource in Montgomery County. According to Feeding America’s Map the Meal Gap study of 2018, approximately 63,000 of Montgomery County residents do not know where their next meal will come from. Each day we provide an average of 179 families with nutritious food to reduce uncertainty and promote stability. We will not rest until Montgomery County closes the full gap and ends food insecurity in our community. Recent reports from the Montgomery County Public Schools (MCPS) website indicate that 35.1%, of students are eligible for Free or Reduced Meals due to the low income levels of their families. Even working collaboratively with two other peer agencies, only 11% of the FARMs-eligible elementary school student population were served. Thanks to a network of community partners, Manna reached 2,850 children in 58 schools. We are committed to adding at least 50 students to our roster again this year. Manna can’t end hunger alone, and that’s why we were proud that our local community donated 62,489 hours of volunteer service last year. By sorting produce, packing boxes, turning out for food drives, and scheduling pick ups, volunteers made our work possible. Out of our 12,000 square foot warehouse, Manna accepted and shared over 3,000,000 pounds of food. As the Coordinator of Community Food Rescue our aim is to increase food rescue county-wide by 20%. We believe that with support, opportunity, and encouragement, many of our neighbors can become self-sufficient. That’s why we offered 95 nutrition education experiences helping 1,238 individuals prepare healthy meals. The future of Manna will focus on poverty alleviation and the promotion of self-sufficiency. It is our ultimate goal that hunger is no longer an issue in Montgomery County because the most vulnerable—the disabled, the elderly—will be cared for and the working poor will be self-sufficient providing for themselves. We will expand our programs as needed and we will also continue to work on establishing partnerships and collaborations with other organizations to reach those in need and address the root causes of hunger.